The European Space Agency (ESA) wants you to play video games with flying drones so it can develop better space robots. A free app that runs on the iPhone or iPad lets owners of Parrot AR.Drone quadricopters navigate their remote-controlled robots to perform dockings on a simulation of the International Space Station. Using crowdsourcing, the ESA figures it will arrive faster at improved methods for robotic docking strategies. 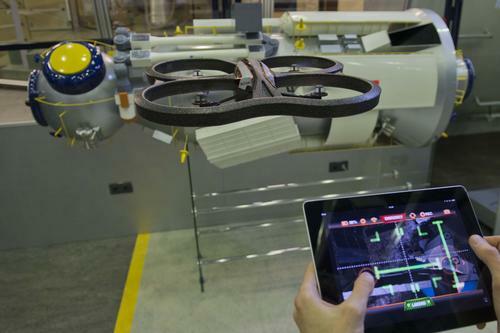 The new AstroDrone app is part of a larger ESA project run by its Advanced Concepts Team. This Artificial Intelligence project aims at collecting data via crowdsourcing about how robots navigate their environments. In particular, it’s aimed at improving robots’ abilities to autonomously estimate distances to other objects, a skillset clearly needed in the complex task of docking in space. Partial image data, which the team calls Speeded Up Partial Features (SURF), is identified by the team’s OpenSURF algorithm. This algorithm identifies objects with specific image sizes and their orientations. The identification of an object’s size, shape, and orientation, and the extraction of such partial data from a still image, sounds very much like sophisticated industrial machine vision software used in object recognition and defect detection. On the player’s iPhone, SURFs are extracted from a sequence of still images using Willow Garage’s OpenCV. Players then send this data, along with information about the robot’s height, attitude angles, velocities, and other data about its state, to a central database. Also, as players log their game scores on the app’s high-score table, they can send their performance data. All of this input is anonymous: no GPS data or raw video images are sent. The only data players send is the abstracted mathematical features of images that the drone sees and uses for navigation, as well as velocity readings. The AR.Drone 2.0, which can be controlled by an iPad or iPhone, carries a lot of hardware to make the project possible, including two different cameras: a 30-fps HD 720p with a 92-degree wide-angle lens, and a 60 fps vertical QVGA for measuring ground speed. Its embedded 1-GHz 32-bit ARM Cortex A8 CPU has 800 MHz video DSP and runs Linux 2.6.32. Memory is 1Gbit of 200-MHz DDR-2 RAM. Sensors include a 3-axis accelerometer, a 3-axis gyroscope, a 3-axis magnetometer, and ultrasound sensors for measuring ground altitude. With about 500,000 AR.Drone quadricopters in gamers’ hands, the ESA team hopes using high numbers of players and multiple inputs will help the researchers develop spacecraft that are autonomous and can independently, and correctly, dock and land themselves. The key to this is creating a database of SURFs for objects with standard sizes, combined with a set of corresponding distances. From this information, algorithms can be developed that accurately extract distances from images once an object and its features are identified in the database. The team is planning more levels of the game that will guide the AR.Drone to connecting with other space objects — such as the agency’s 2014 planned rendezvous of its Rosetta probe with the 67P/Churyumov-Gerasimenko comet — as well as versions of the app for other, unspecified devices.